This month we have been working on letters R-W ,with art & craft highlighting them. 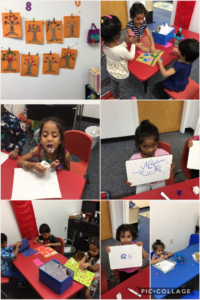 They loved painting & creating interesting figures with the letters. We have been on good manners, parts of the body ,the numbers 1-10 . The most amazing is to see my kids writing their names confidently. Wish you a happy & prosperous 2019! Once again the kids have returned with great enthusiasm. With hands on cutting & coloring my little angels can identify the colors & shapes along with letters from L, l- Q,q. It is so sweet to hear them using the magic words PLEASE, THANK YOU & SORRY I the class. Hope you encourage them to use these words at home too. All the best to my little cherubs! 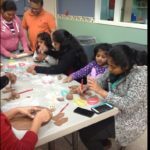 December was full of fun activities with art and crafts resembling the atmosphere of Christmas! It was so amazing to see how the kids were happy to get presents from Santa, participate in games & have refreshments with their parents. Similarly they experienced the first Snow storm. Certainly the snow is a symbol of Santa coming from the North Pole! 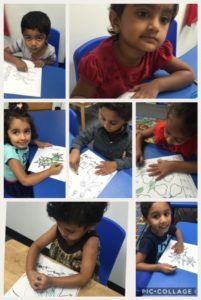 With all these activities my tiny tots did their work sheets with enthusiasm! Wonderful !!!! Then comes the Happy Holidays! Have fun my LITTLE STARS! Time is flying & our kids are growing! 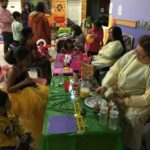 October the month of Halloween was full of fun with art and crafts , science night with Candy from the monster house and many more activities. Similarly November the month of THANKS GIVING has given the kids an opportunity to thank GOD for all blessings they have received . The kids are doing great! All the best to my little angels! 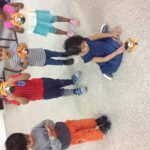 They have been very active during circle time with singing , dancing, counting & listening to the stories read to them. They have been learning the names of the days & most of them happily come forward to say them. 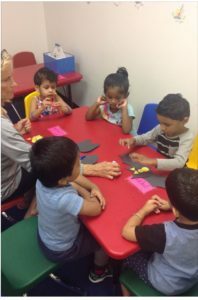 They have learned to identify the uppercase & lowercase A, B, C , D, E,& F along with practice to write them. They could also count from 1-10 & write some of them. Now we are working on identifying the letters of their names. It is really amazing to watch the progress of these tiny tots continuously. It is a pleasure to have them in my class! Month of red blue & white, to celebrate independence was really exciting. The kids created their head bands & the flag of America. 1-We have worked on the numbers 1,2 & 3. Letters A,B & C.
Coloring , tracing & writing in rainbow colors. 2- we have exposed them to cutting with the scissors which is an important life skill. 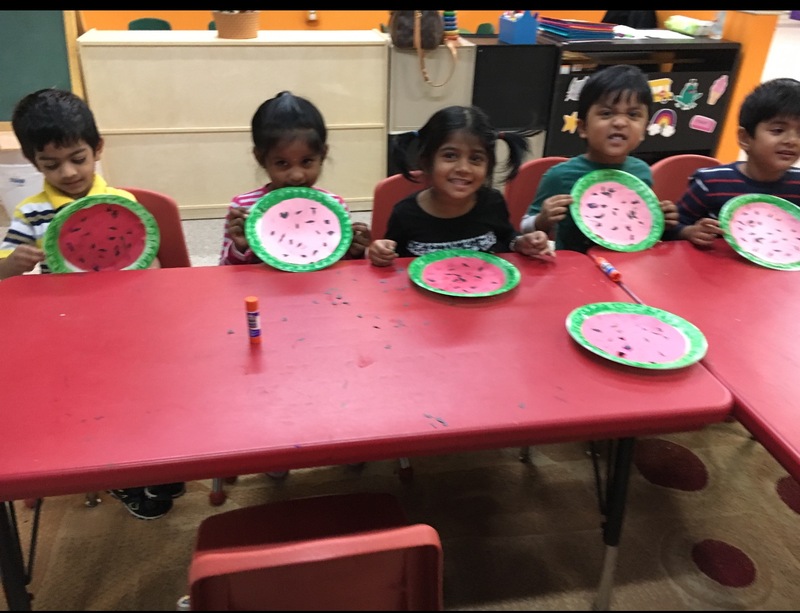 They are doing great through fun & play. Dear parents please help your kids continue doing all they learn in school through their own circles of experience at home. Yes, they will turn out to be UNIQUE! 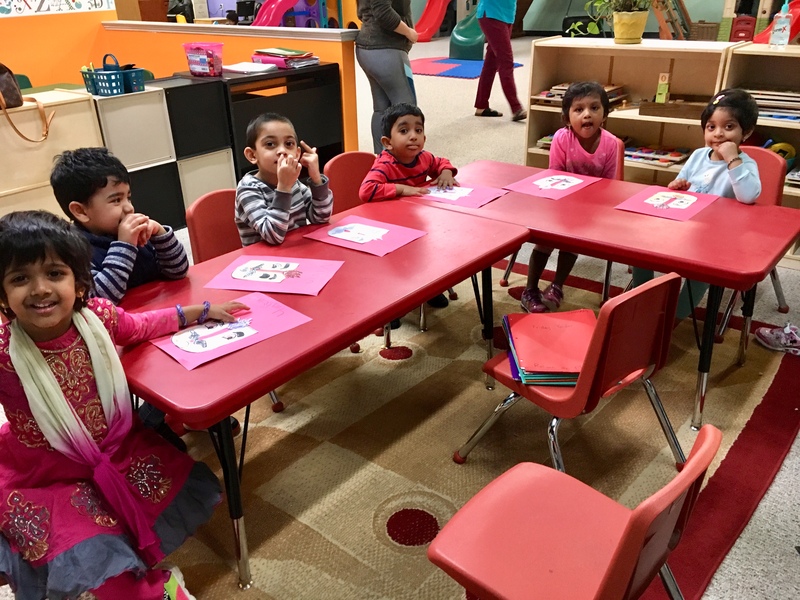 March was a great month with a lot of fun activities along with counting, reading & writing..
1– kids started off with the days of the week. 2–It was a delightful sight to watch the kids running around hunting for Easter eggs to fill their baskets. 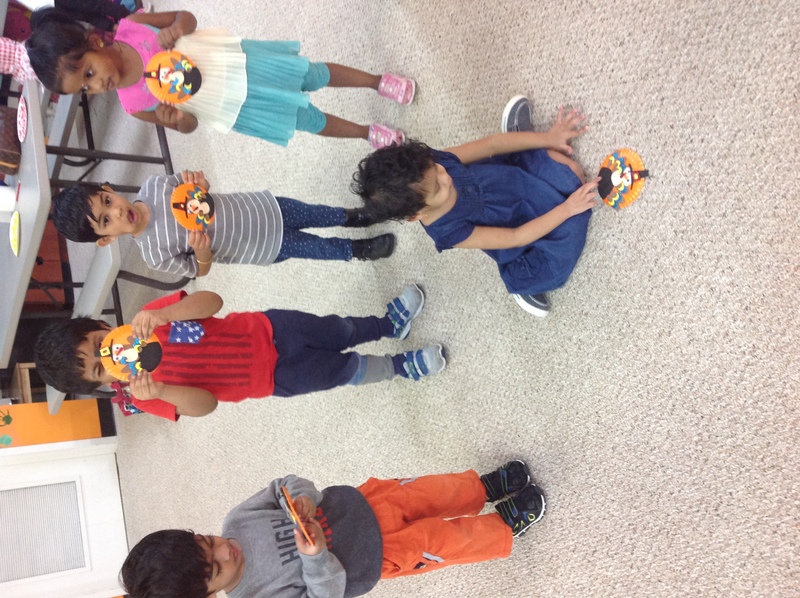 3–As a Science project , the kids created their own binoculars & had fun viewing tiny objects around. Way to go MY LITTLE SCIENTISTS!!! I am Bernadette Diaz , mostly known as Bernie. I joined Angelz Funtime on the 2 new January 2018. I warmly welcome your child along with you into my classroom. As a teacher I have spent my life time among kids ,helping them to develop physically,socially ,emotionally,spiritually & academically. With great pleasure I have watched them bloom into successful bright STARS. # Each child is unique in its own way! # Each child is talented & educable ! # Each child is MY CHILD with all my LOVE ! The following is a summary of the work the children have done for the month of January. The color of the month is WHITE with a lot of snow all around us. 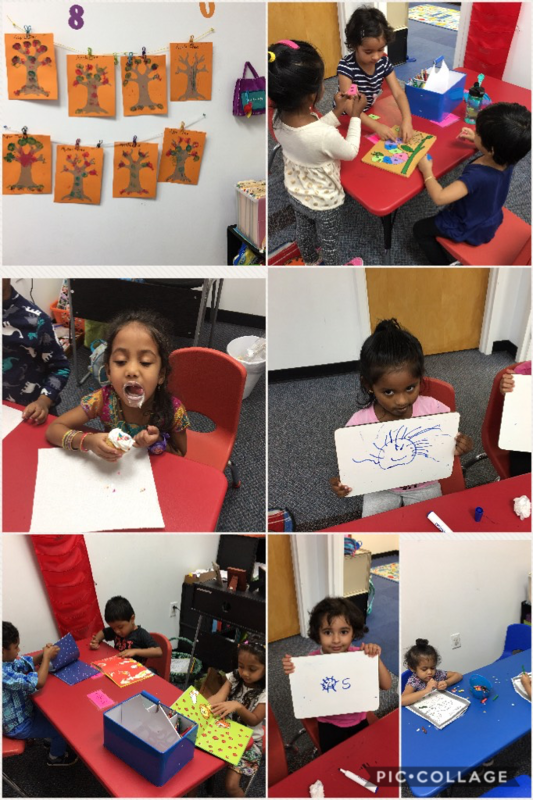 We have been working daily on phonic sounds through singing & dancing while exposing the children to uppercase & lowercase letters, counting & writing from 1- 20, identifying shapes & colors & introducing social workers. 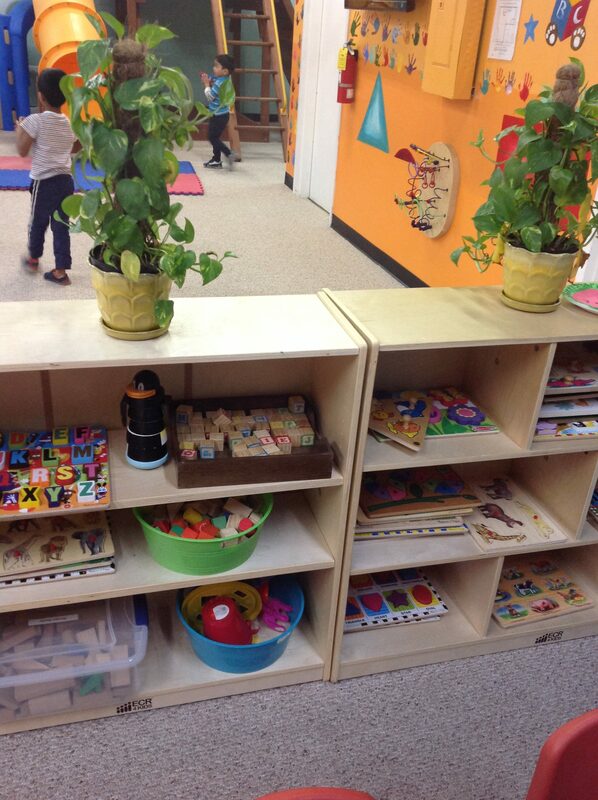 We have also talked about personal cleanliness, potty training & good habits through stories. It was fun to see their hands on cutting & pasting different items , along with a lot of coloring. The children have been doing great in facing these challenges happily. I am PROUD of them! December was a fun filled month for all of us. We had a grand Christmas party at our school. Kids were very excited to get gifts from Santa. We are still working with the numbers. They are doing really good on counting the objects. We are still working on writing alphabets. We read some story books based on winter season. In the story time , they learned how we can keep ourselves warm during winter. We worked with the alphabet M,N,O in this month. We learned some new words starting with these alphabets. From January we will be working with phonics. 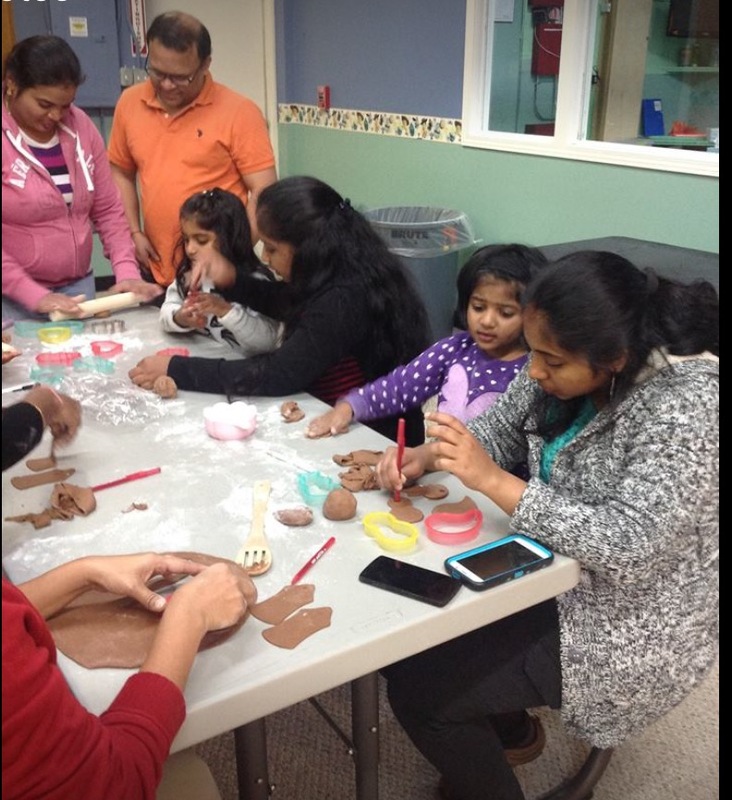 We did take part in Christmas ornaments making for the kids at UNC Hospital. 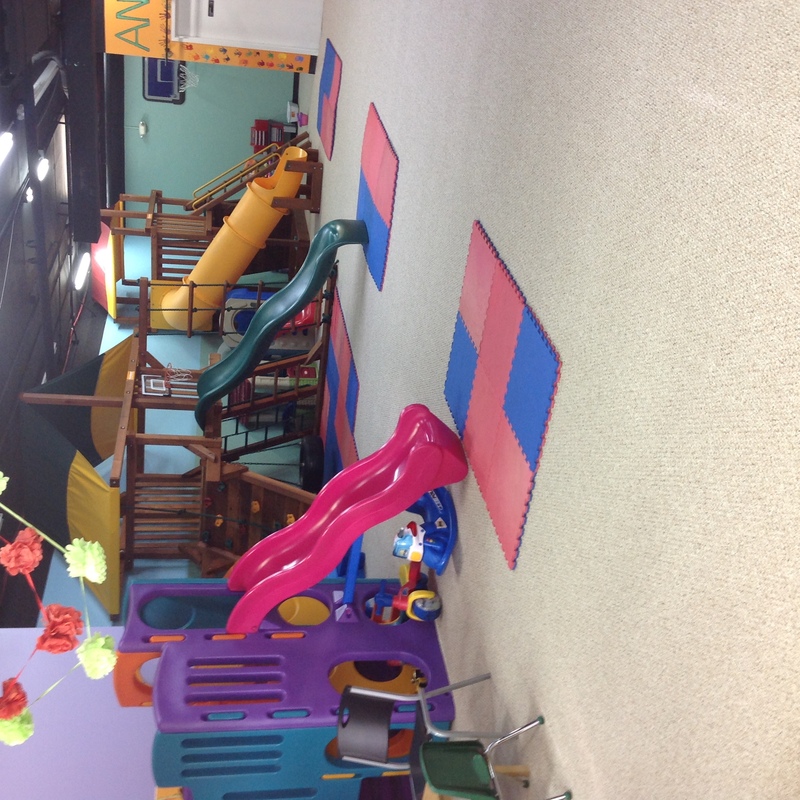 Thanks to all our Angelz Funtime parents for helping us on this project. We really appreciate for you time. We will learn more with full of energy in 2018. Very Happy New Year to you all!!!! November went by very quick. Our kids had nice time learning with us. We are working with number 11 through 20. We also started working on counting the objects and match them with the correct number. They did awesome job on that. We are still working on our writing skills. We had some art projects this month based on alphabets, veteran’s day and Thanksgiving day. We hope that everyone had a wonderful Thanksgiving with your friends and families. We have lots of things planned for December. Thank you everyone for being with us and give us encouragement to work more with your kids. October has all but passed us by and what a busy month is was. Your children have been working very hard and making great progress. We have been working on our alphabet and numbers review and starting to put our letters together to form simple sight words. We will continue on this exercise into November. We reviewed our numbers 1-10 and now are starting on 11-20. We will be celebrating Halloween with a party on Saturday, October 28th. Please join us for this fun event. Should be a “hollowing” good time for all. November is just around the corner and we will be working on many art projects this month starting with November 10th Veterans Day. We will honor our veterans for their service and sacrifice for our country. On the week of November 23rd we will celebrate Thanksgiving. We will spend our circle time discussing and reading stories about this very special day. Again my students are very excited about learning and I know they will grow, learn, and develop in the months and years to come. Welcome to the new school year! This should be a fun and exciting year and I am looking forward to working with you and your children. I will be sending folders home every Friday with your child’s weekly work sheets and homework. Please work with your child on the skills on the worksheets and return folders on Monday. We have had a busy September thus far. My class has been working on their letters in preparation to writing their names. We will be using a new order for learning our letters and we are using dry erase boards to practice the alphabet and numbers which the students are really enjoying. Also we are working this month on the numbers 1-10 as a review. October is quickly approaching and this month will be packed full of fun projects and events. I will continue my lesson plan working on the alphabet in readiness for my class to start writing their names. Also we will be doing art projects to celebrate the October holidays. Columbus Day is on the 9th and Halloween is on the 31st. 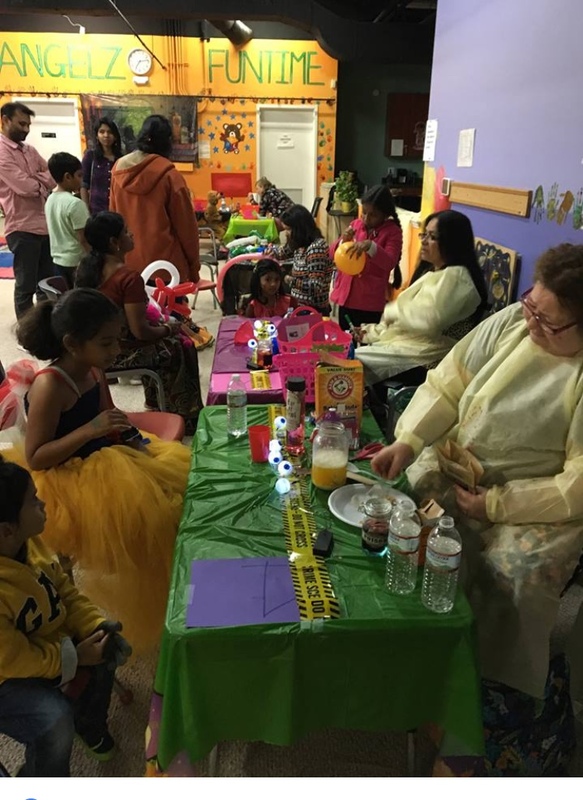 We will be having a Halloween party on Saturday October 28th for all the students and families, which will be very spooked filled and a lot of fun. More information will be available in the next week or so. 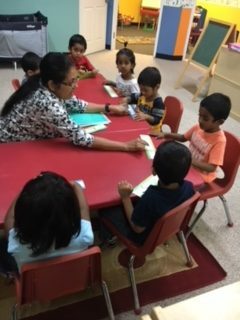 Again my class is very excited about the new school year and I am looking forward to the months ahead, watching your children grow, learn, and develop. August was fun filled month for kids. 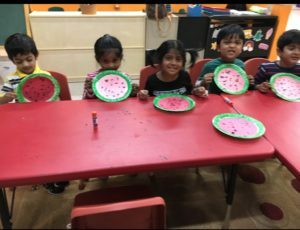 They enjoyed many activities. 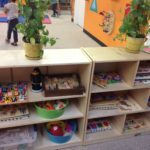 We read stories and let kids participate through action movements like dancing, singing and acting part of story telling. Kids loved the dancing part and they look forward to this activity. 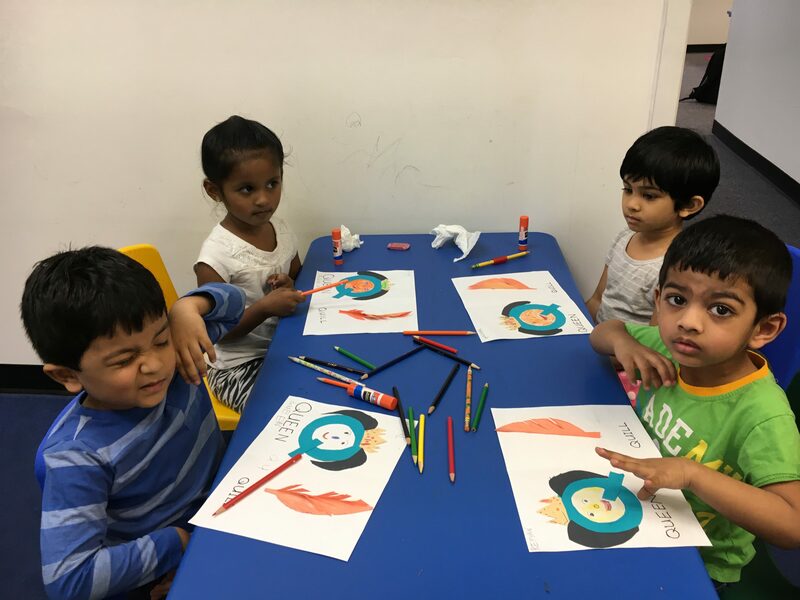 We did covered colors through different animals, vegetables, food. We reviewed shapes with kids. We did connecting letter, completing the maze and finished E,F,G and 5,6,7 this month. Transition classroom kids learn the alphabets, worked with numbers.